Members of IWC Sta. Barbara and IWC Dagupan together with District Chairman Lucy Jose joined Past National President (Dra.) 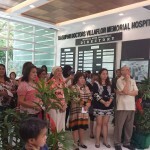 Nene Villaflor in the opening of Art Exhibit of the Northern Cancer Society at Dagupan Doctors Villaflor Memorial Hospital. 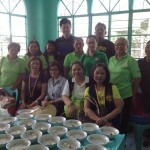 IWC of Dagupan launched 120 days Feeding Program for 25 under nourished children at Brgy. Pogo Chico,Dagupan City last Aug 13,2015. Members of IWC Downtown Dagupan distributed eyeglasses to 100 senior citizens of San Fabian, Pangasinan. In the celebration of National Mental Health Week and World Mental Health Day last Oct 13, 2015, IWC Dagupan of D379 participated in the Spot Poster Making Contest of the Philippine Mental Health Association (Pangasinan).